The Black Swan Report › The Black Swan – Second Edition Now Shipping! This title was released on May 11, 2010. Order Here. become obsessed with robustness, and that accounting for the additional 100 pages… Sold! bent pages, cracked spine etc. This was written by John. Posted on Monday, April 12, 2010, at 5:04 pm. Filed under Books, John. 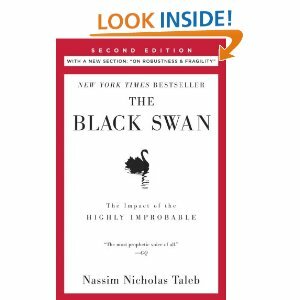 Tagged amazon, nassim taleb, robustness, the black swan second edition. Bookmark the permalink. Follow comments here with the RSS feed. Trackbacks are closed, but you can post a comment. I’m definitely buying the new edition. See what new ideas or methods to deal with randomness has NNT conjuncture and,perhaps, test them. This will be my third reading and I’m really looking forward to it. There is so much to absorb, so I welcome the new edition, and the new 100 pages. Plus, it’s such an experience just to read it. The book arrived on Wednesday. Got mine yesterday (May 12, 2010). Thanks for stopping by.